Girl Scouts of San Gorgonio Council's Blog reports that when it came time to select a Girl Scout Gold Award project, Alexis Bush and Danielle Tasake of Troop 686 in Grand Terrace knew exactly what they wanted to do. Moved by the plight of women and children in Uganda, they decided to join forces to raise awareness and support literacy and education in that troubled part of the world. The girls are joining forces to raise awareness of these issues within their community through a Book Drive/Awareness Day. In Austin, TX, The Statesman reports that six area Girl Scouts earned The Girl Scout Gold Award for a documentary film project. The students created and taught a two-week film camp for younger Girl Scouts, during which they produced a short documentary, "Beyond Pink and Blue," about gender roles in contemporary society. The camp taught participants film skills and helped raise awareness in the community about gender differences. The film was screened for family, friends and other scouts and will be shown on ChannelAustin and featured in upcoming film festivals. 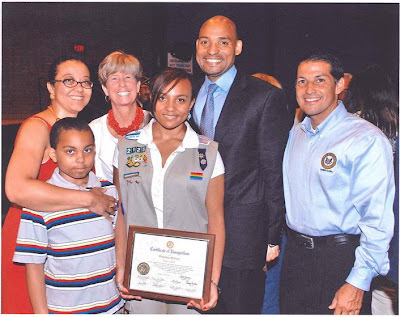 In Illinois, The Courier-Times reports that Bartlett residents Elizabeth Gorski and Diana Lewis were among 27 Girl Scouts in northern Illinois who earned the Girl Scout Gold Award in 2011. The projects ranged from restoring historical garden to promoting the importance of good nutrition. New York's Long Island Herald reports that Malvernite Brieonna Ramsey spent time teaching children about the classical American one-room schoolhouse to earn her Girl Scout Award, while her neighbor, Sarah St. John, worked to raise awareness of Alzheimer’s disease to earn hers. Ramsey’s work preserving the history of a local one-room schoolhouse began after she discovered the fascinating historical structure had stood quite recently in Hempstead. St. John’s service centered on the fight against Alzheimer’s disease and her “For the Memories Forgotten” project derived from her family members’ personal experience with the disease.